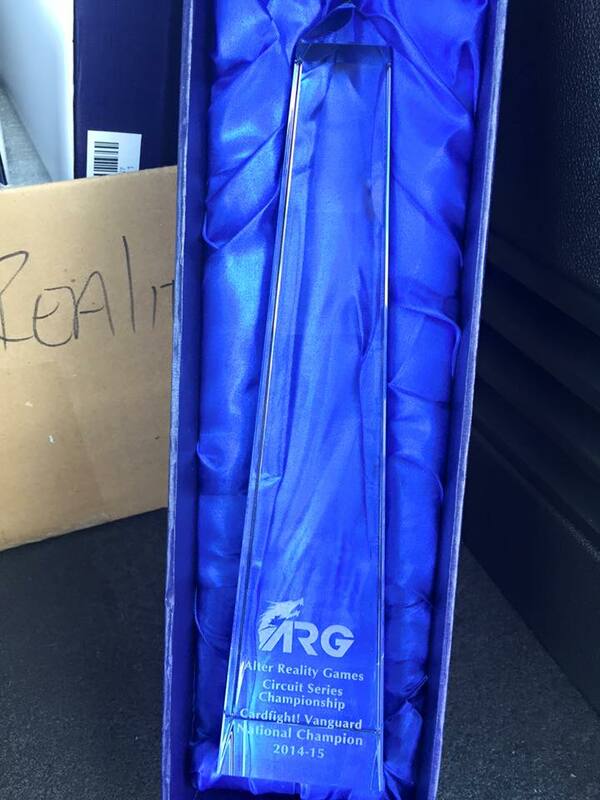 This weekend Alter Reality games will be holding a special event to thank those that supported their Circuit series tournaments this year, followed by the 2015 national finals. The special event will last from 12 PM to 5 PM on August 14th, and those attending will be able to play against community organizers Robbie Kohl, William Cole, and Jonathon Mindham. The winner of the event will receive a special edition playmat (pictured below) featuring characters in the likeness of Mindham, Kohl, and Cole. Only twenty-five copies of this playmat exist. Top 16 for the national championship on the 15th will receive an Amnesty Messiah playmat (pictured above), and the national champion will be awarded with the championship trophy seen at right. The promotional cards White Dwarf Lady Battler and Fiercebau--both distributed at Bushiroad's earlier New York regional qualifier--will be tournament legal for the ARG national championships. Cardfighters should take note that unused ARG points expire after the finals. Points cannot be retained for use in 2016. Those attending the national finals will need to use 20 ARG points earned from previous regional qualifiers to enter, and may use 50 additional points to receive a round 1 bye. Entrants will present their points to points when they register for the tournament. 111 cardfighters have qualified with invitations to the finals, and ARG is planning for a turnout of between 80 and 120 participants. As always, the tournament will use a best-of-three Swiss model to determine the first national champion as fairly as possible. Senior Cardfight Pro editor Touya will be attending to provide coverage of the events, and will be participating in the finals. Today's article was made possible by the donations of our patrons at Patreon. 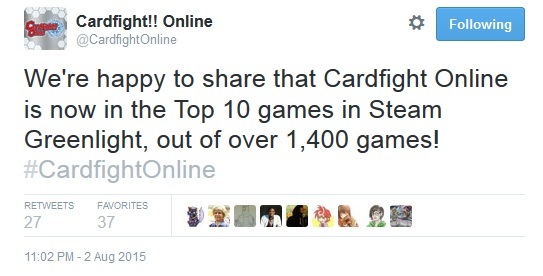 Cardfight Pro is funded by public contributions from readers like you. August 11th, 2015. 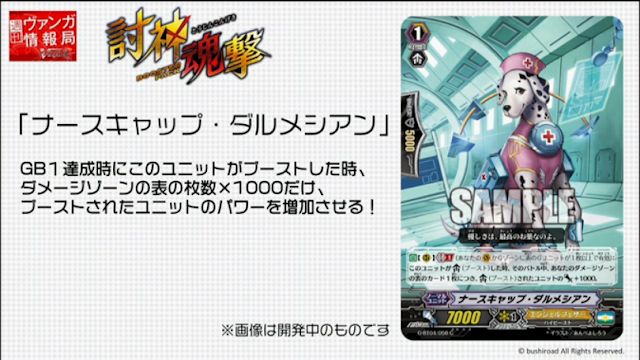 In today's weekly stream, Doctor O leaked three new cards from G-BT04: Soul Strike Against the Supreme for the Angel Feather, Megacolony, and Neo Nectar clans. 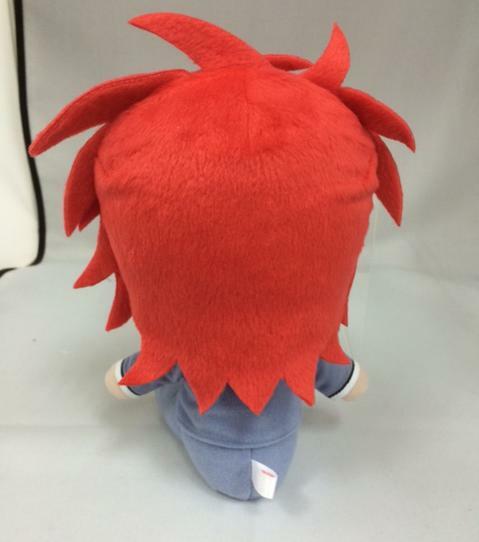 Meanwhile an announcement made through figure production studio Gift's Twitter account teased an upcoming plush doll based on the likeness of Shindou Chrono. 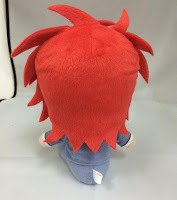 Previously Gift had produced similar dolls of Sendou Aichi, Kai Toshiki, Suzugamori Ren, and Miwa Taishi based on their appearances in the Asia Circuit chapter of the anime, and will debut at Comiket 88, from August 14th through 16th at the Tokyo Big Sight Chrono's plush will be the first based on Cardfight!! 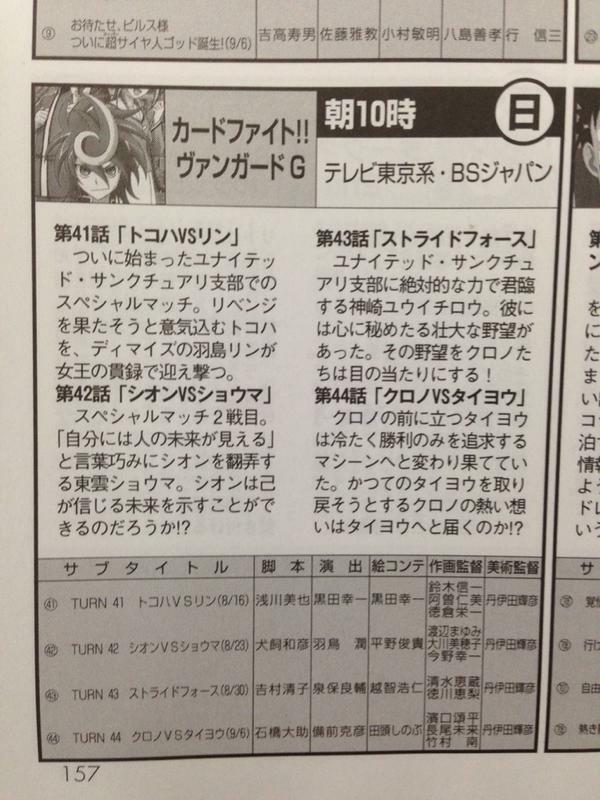 Vanguard G. Four new episode previews for Cardfight!! 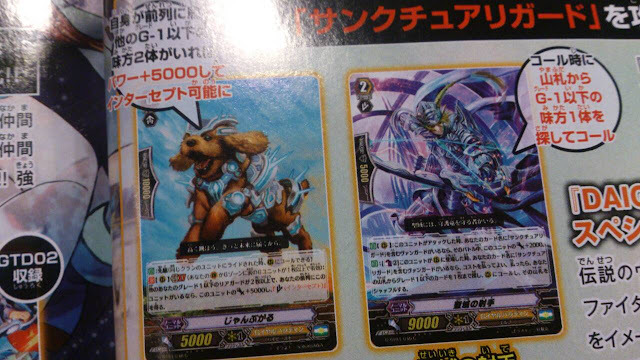 Vanguard G have also been leaked from this month's issue of Monthly Bushiroad magazine. The episode previews, along with the new cards, and a recording of today's livestream are all provided below. Turn 41 "Tokoha VS Rin"
The United Sanctuary branch's special match begins. Tokoha enthusiastically seeks revenge, attacking the princess-like presence of Team Demise's Hashima Rin. Turn 42 "Shion VS Shouma"
Game 2 of the special match. 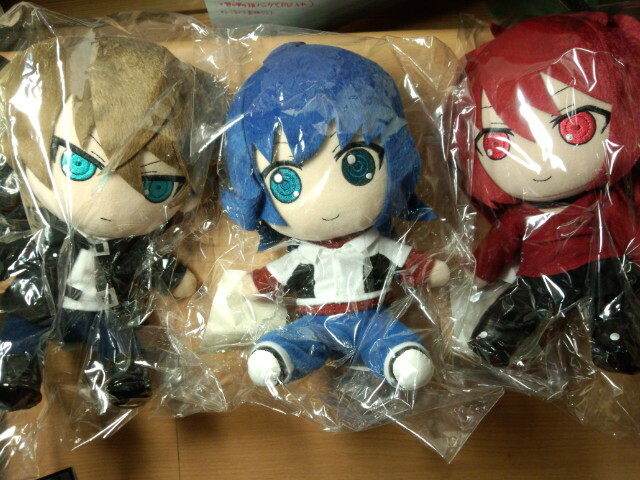 Shinonome Shouma toys with Shion with the words "People see their own futures." Can Shion show the future for himself that he believes in!? Kanzaki Yuuichirou reigns over the United Sanctuary branch with absolute power. Hidden in his heart is a grand ambition. Chrono and his friends will face that ambition head-on! 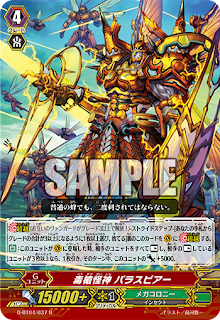 Turn 44 "Chrono VS Taiyou"
Standing before Chrono is the Taiyou that coldly pursued victory and became like a machine. 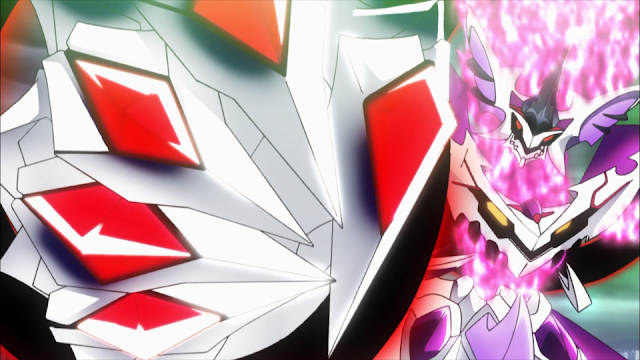 Can Chrono's burning ideal reach him, and take back the old Taiyou!? AUTO (Rearguard circle): Generation Break 1: When this unit boosts, during that battle, for each face-up card in your damage zone, the boosted unit gets Power +1000. AUTO (Rearguard circle): When this unit boosts a vanguard with "Machining" in its card name, if your opponent's vanguard and rearguards are all at rest, soulcharge 2. AUTO (Generation Break 1) [Counterblast 1, soulblast 1] When this unit is placed on a rearguard circle, if you have a grade 3 or greater vanguard with "Ranunculus" in its card name, you may pay the cost. If you do, choose one of your other rearguards, search your deck for up to one card with the same name as that unit, call it to a rearguard circle, shuffle that deck, during this turn, this unit gets Power +2000. During the stream Doctor O also revealed that a pair of Pacifica and Shizuku deckboxes and sets of promotional sleeves will be available for purchase at Comiket 88, as well as related merchandise to promote Touken Ranbu -ONLINE-. The stream attracted over ten thousand live viewers during its run. August 9th, 2015. The second Phantom Vanguard Championship site updated today with complete decklists for the top 4 cardfighters, as well as a more complete deck breakdown over what was previously given. While the tournament has been primarily noted as the resurgence of Glendios, in third place was the first Japanese Duo top since the second Kansai Vanguard Championship, over a year ago. Top 8 at the Phantom CS was Healer (Glendios), Toothpick (Sanctuary Guard), Hanta (Duo), Nekono (Glendios), Sanba (Royal Paladin), Gungnir (Revenger), Tomo (Kagerou), and Derrin (Kagerou). 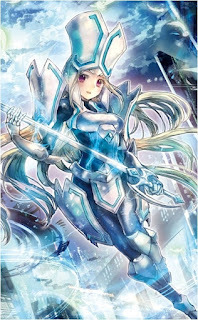 Hanta's Duo deck includes just four grade 3s, running additional copies of his first vanguard in place of the remaining ones in order to abuse Darling's ability to return Peace to hand to repeatedly resolve her draw and countercharge skill to add up to four cards to hand. Using this strategy, up to one third of the main deck can be added to hand in a single turn if all of the possible combo pieces come together, and Duo's new legion Nemuel is designed to facilitate this by searching out copies of cards returned to hand. Shadow Paladin was the most played deck of the Phantom CS, followed by Royal Paladin, and Bermuda Triangle. Glendios had previously topped the Kansai Spring Cup and West Japan VGCS in early May, and has since become a prominent rogue that has popularly superseded the Messiah deck in Japan. Phantom CS champion Healer's Glendios deck was similar to that used at West Japan, running fourteen grade 3s to capitalize on “∞” Glendios' ability to trap the opponent in a full-field lock as much as possible. The addition of Vorium from Sovereign Star Dragon similarly plays into this pursuit of the deck's alternative win condition, adding “Яeverse” units to hand to get five into play as quickly as possible. August 8th, 2015. This morning Gungnir, winner of the 2014 Hachioji Cup and veteran of the Japanese professional community, tweeted the results of the second Phantom VGCS. First place went to Healer playing Glendios, second to Toothpick with Sanctuary Guard, third to Hunter playing Bermuda Triangle, and fourth to Nekono also playing Glendios. This statement was confirmed by tournament organizer Yuihan, who thanked everyone for their support in holding the tournament. Decklists will likely come out within the next few days. 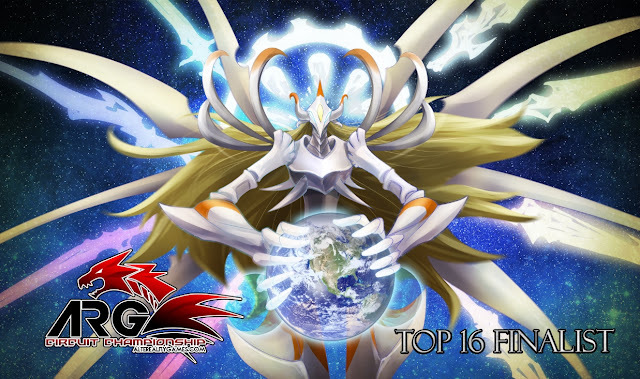 A breakdown of the top 16 cardfighters is provided below. The Glendios fighters that made the top cut represented a very slim minority of entrants, as they were two of the only four Link Joker cardfighters present, all playing Glendios. The Messiah deck, in spite of initial hype, has not caught on strongly in Japan. 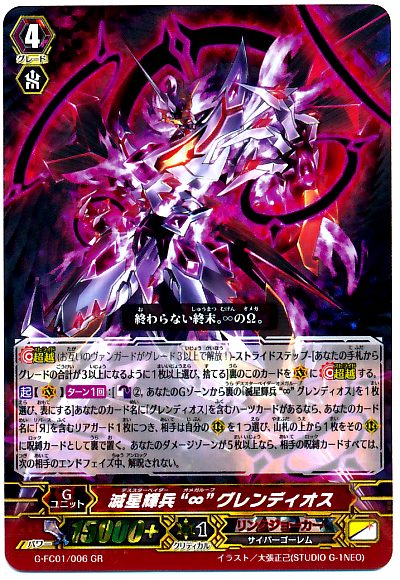 Royal and Shadow Paladin have alternately dominated tournament results since the launch of Sovereign Star Dragon, with Kagerou taking a backseat to the two primary Paladin clans. Royal and Shadow together made up almost half the entrants at the Second Phantom CS, with Revengers alone accounting for 34% of participants. It should be noted that the most played deck at this Phantom CS was also not played by anyone in top 4, and that Bermuda Triangle was the third most played deck of the tournament, a trend that has been growing in Japanese play since Academy of Divas' launch. Entry at the Phantom VGCS cost 1500 yen (approx. $12 US at the current exchange rate), and first place won a New Nintendo 3DS XL, as well as entry into a sub-competition for a copy of Splatoon. Second place won an official Amnesty Messiah playmat, as well as one box of Soul Strike Against the Supreme. Third place also won an Amnesty Messiah playmat, and fourth a Lambros mat. The five preliminary rounds used a 30 minute best-of-one format, while the cut to top 16 used a 50-minute best-of-three tournament bracket. The first round of the tournament began at 10:30 AM, with the final preliminary finishing at 1:40 PM, and the cut to top 16 began at 2:40 PM. The finals ended at 6:30 PM, with the tournament dispersed by 8 PM. The VGCS tournaments are a series of unofficial tournaments organized by fans and cardshops. Unlike Bushiroad's official tournaments, most VGCS events are done using a best-of-three, Swiss tournament model. Turnout is typically 70-80 persons, but some events see 100 or more participants, all of whom compete using pseudonyms and internet handles rather than their real names as in official events. The VGCS model of fan-organized play has begun to gain popularity internationally, with the bi-monthly BeNeLux tournaments serving as their European equivalent, and there are now similar grassroots organizations emerging in the United States like the ARG Circuit series tournaments. Today's article was made possible by the donations of our patrons at Patreon. 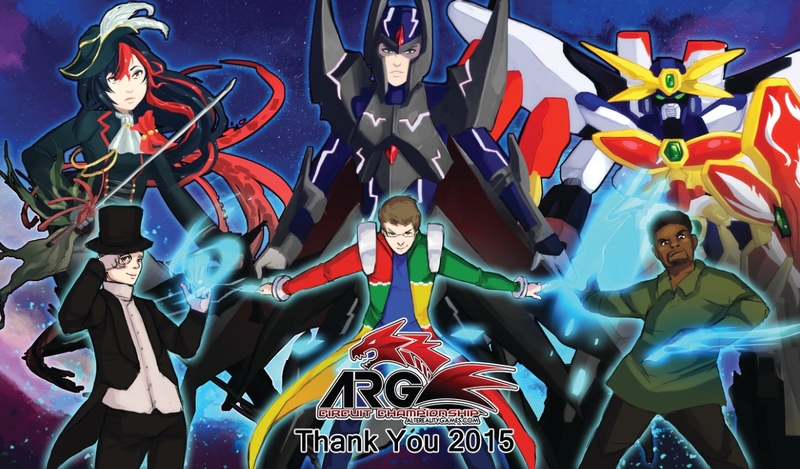 Cardfight Pro is funded by public contributions from readers like you. August 7th, 2015. This morning Cardfight!! Online was finally greenlit by the Steam community, leading to outreach by Valve Corporation to Bushiroad to make the online game available through their software distribution platform. The online game, which was only announced a month ago, is set to launch within 2015 as a free-to-play means of playing the Cardfight!! Vanguard trading card game through the web. 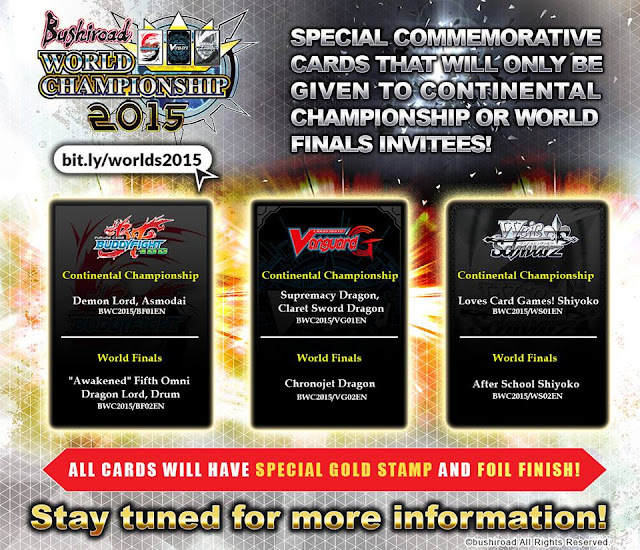 In other news, Bushiroad announced through Facebook today that their 2015 World Championship series will introduce commemorative prints of existing Cardfight!! 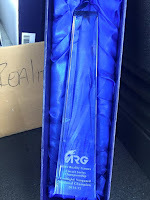 Vanguard cards, to be given to the finalists of the national and international championships. 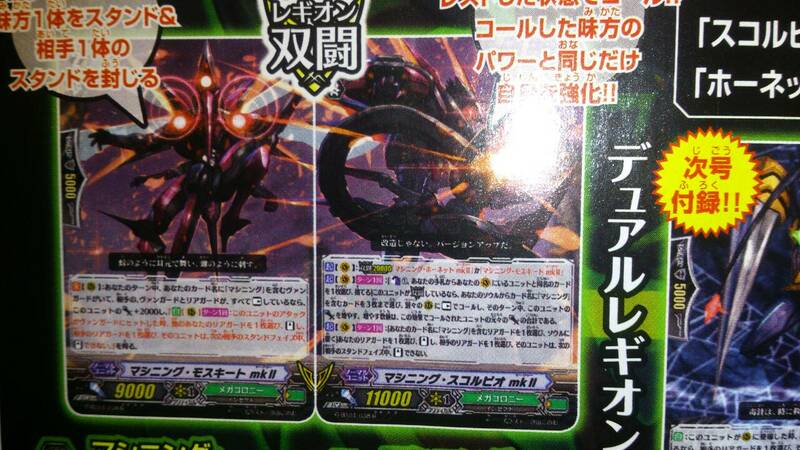 The cards currently know to be distributed are Supremacy Dragon Claret Sword Dragon, and Chronojet Dragon. Each card will be gold stamped and have a unique foil, different from its original print. August 6th, 2015. 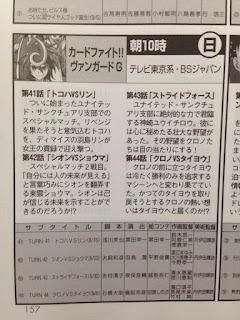 Approximately twenty-four hours prior to street date, fans have leaked images from the most recent issue of Monthly Bushiroad magazine, revealing an upcoming legion as well as reprint for the Machining subclan in G-BT04: Soul Strike Against the Supreme. A remake of Machining Stag Beetle from Comic Style Vol. 1, the legion combines improved superior call with power gain, and being able to paralyze the opponent's rearguards to prevent them from standing. 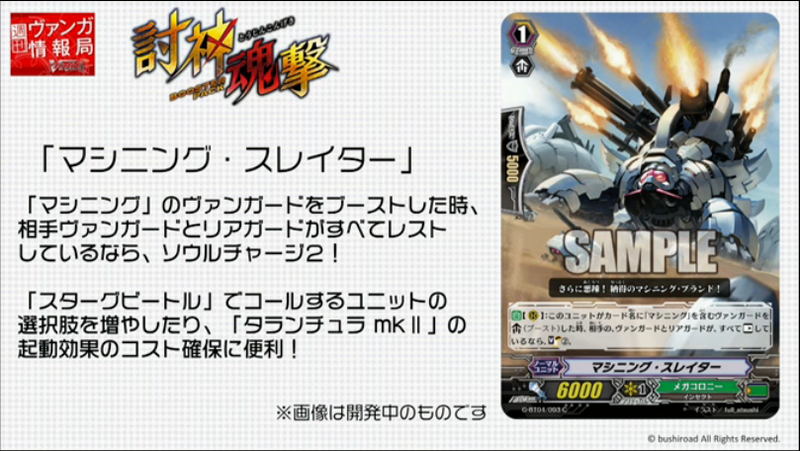 The issue also unveiled new units specifically designed for the Sanctuary Guard Regalie deck, and Angel Feather breakstride support from G-BT04. 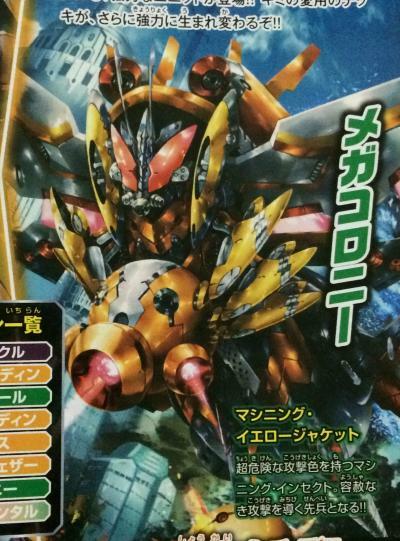 The issue also revealed that the existing Machining legion, Machining Tarantula mk II , will be reprinted in G-BT04, and that the promotional card "Blaster Rapier, Lola" from Koshimizu Makoto's Swordsman of Light manga will be packaged with next month's issue. 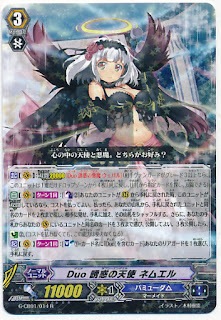 ACT (Vanguard circle): Once per turn: [Counterblast 1, choose a card with a same name as a unit on your vanguard circle, discard it] If this unit is in legion, choose up to three cards from our soul with "Machining" in their card name, call them to separate rearguard circles as rest, during this turn, increase this unit's power. The increment is equal to the combined power of all units called by this effect. 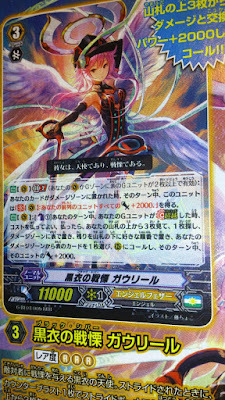 ACT (Vanguard circle): Once per turn: [Choose one of your rearguards with "Machining" in its card name, put it into your soul] Choose one of your rearguards, stand it, choose one of your opponent's rearguards, during your opponent's next stand phase, that unit cannot stand. CONT (Rearguard circle): During your turn, if you have a "Machining" vanguard, and if your opponent's vanguard and rearguards are all at rest, this unit gets Power +2000, and "AUTO (Rearguard circle): Once per turn: When this unit's attack hits a vanguard, choose one of your other rearguards, stand it, choose one of your opponent's rearguards, during your opponent's next stand phase, that unit does not stand." 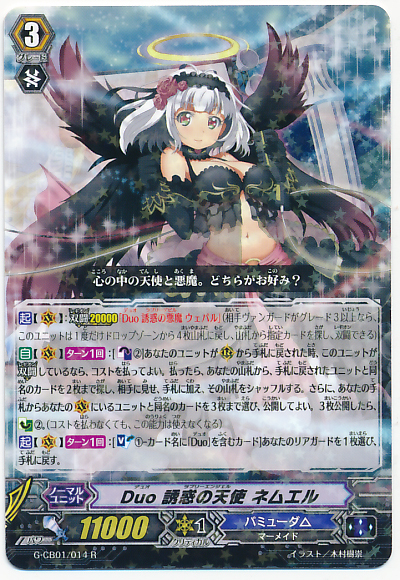 CONT (Rearguard circle): Generation Break 1: If you have two or more other grade 1 or less rearguards, and if this unit is in your frontrow, this unit gets Power +5000, and Intercept. AUTO (Rearguard circle): When this unit attacks, if you have a vanguard with "Sanctuary Guard" in its card name, during that battle, this unit gets Power +2000. 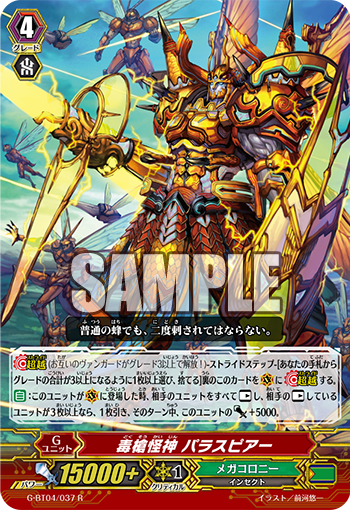 AUTO: [Counterblast 2] When this unit is placed on a rearguard circle, if you have a vanguard with "Sanctuary Guard" in its card name, you may pay the cost. If you do, search your deck for up to one grade 1 or less card, call ti to a rearguard circle, and shuffle that deck. 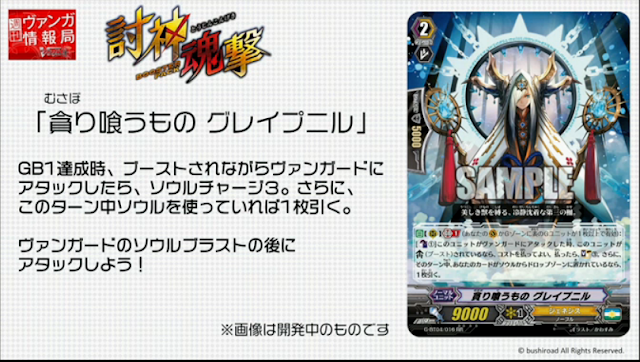 AUTO (Vanguard circle): Generation Break 2: When one of your cards is put into the damage zone, during that turn, this unit gets "CONT (Vanguard circle): All of your units in your frontrow get Power +2000." AUTO (Vanguard circle): [Counterblast 1] During your turn, when your G unit strides, you may pay the cost. If you do, look at three cards from the top of your deck, choose one, and put it into your damage zone face-up. Put the remaining cards on the bottom of your deck in any order, and choose a face-up card from your damage zone, call it to a rearguard circle, during that turn, that unit gets Power +2000. Gavriil's generation break 2 and stride bonus skill amasses their past boss cards Chief Nurse Shamsiel and Circular Saw Kiriel into a single card, providing a powerful alternative deck to Celestials that can even gain power bonuses during the opponent's turn when damage is checked, or swapped through the guard circle of Nociel . Her name comes from the Russian reading of Gabriel; in Japanese Gavriil is transliterated as ガウリール while Gabriel is ガブリエル. Soul Strike Against the Supreme will launch in Japan on August 28th, and in the United States on October 2nd. News: Maelstrom, Tetra-Drive, Thavas to Receive Support in "Commander of Waves"
August 6th, 2015. The Japanese Cardfight!! Vanguard portal updated this morning with new images and information for the previously-announced Aqua Force clan booster, G-CB02: Commander of Waves. 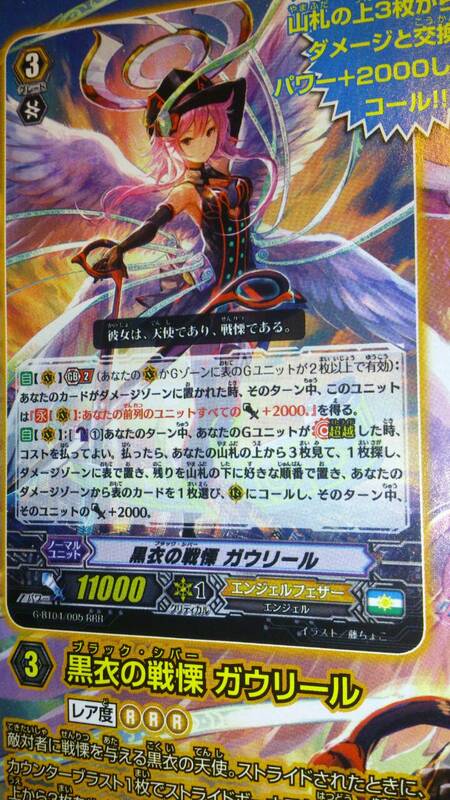 Like G-CB01: Academy of Divas before it, this clan booster will introduce a new mechanic, "Wave." The set will feature an evolved form of the clan's breakstride Thavas , "One Who is One With the Storm, Thavas" as well as support for the Maelstrom , Tetra-drive , and Genovious boss cards of past sets. 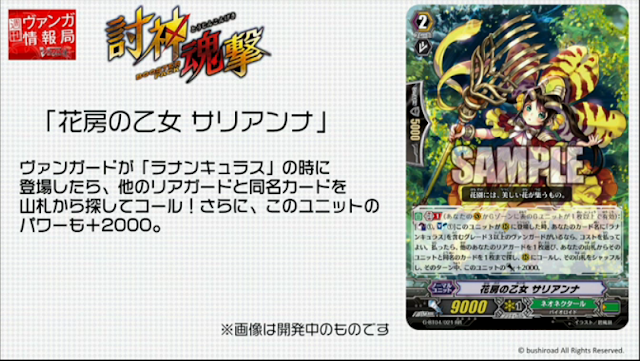 The clan booster will also include a reprint of the promotional card Couple Dagger Sailor. The setlist will comprise 40 cards, 39 new and one reprint; one generation rare, four triple rares, seven double rares, twelve single rares, sixteen commons, and six special parallel cards. One of these SPs will be an alternate artwork reprint of an existing card. Each sealed booster pack will contain seven cards, with two of them being guaranteed to be single rare or greater. Each sealed booster box will contain twelve packs, and retail for 3600 yen (approximately $29 US at the current exchange rate), while individual packs will cost 300 yen (~$2.50). 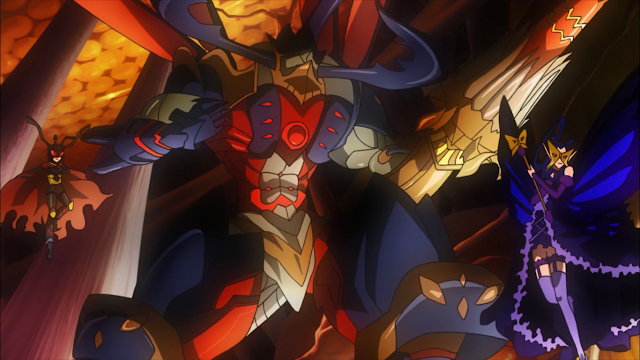 Worth noting is that the Nextage, Ahsha, and Altmile strides in G-BT04: Soul Strike Against the Supreme were also referred to as evolutions during the set's announcement. Commander of Waves will launch in Japan on October 23rd. No international launch date has been given as of yet. August 5th, 2015. 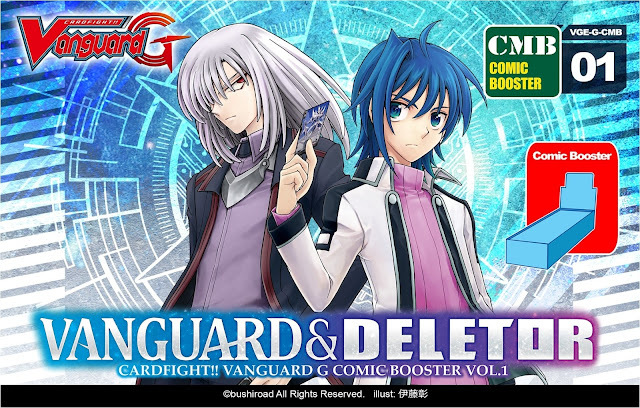 Today Bushiroad Inc. has announced a November 20th launch for the English edition of G-Comic Booster 01: Vanguard & Deletor, which will contain cards featured in Itou Akira's Cardfight!! Vanguard manga. 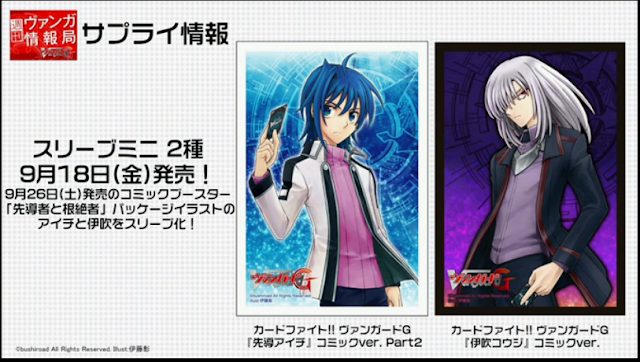 Vanguard & Deletor will feature Link Joker cards supporting Ibuki's "Docking Deletor Greion," and Royal Paladin units supporting Aichi's Alfred deck. There will also be a series of prerelease tournaments from November 13th through the 15th, a week prior to the set's launch date. Although the associated volumes of the Cardfight!! Vanguard manga featuring Ibuki were set to launch this month and in November , according to publisher Vertical Inc. the release of volumes 7 and 8 have been delayed. In total the Vanguard & Deletor setlist will comprise 45 cards; 29 new cards and 16 reprints. The set will include one generation rare, four triple rares, seven double rares, fourteen single rares, nineteen commons, and six special parallel prints of cards from lower rarities. The set will also include alternate artwork prints of several cards. Each sealed box will contain twelve booster packs, with seven cards in each, two of which will always be single rare or higher. Prerelease kits will contain 32 booster packs, with four packs being given out to every player, for 28 cards per participant, as well as 9 promotional cards and two playmats. Artwork published to generate interest in the set shows off Docking Deletor Greion, Blaster Blade in his appearance as Ames (Blaster Blade prior to having receiving his titular sword and having succeeded Yuunos, who became Blaster Dark) in Koshimizu Makoto's Shining Swordsman manga, and Lola (the future Blaster Rapier) of the same. 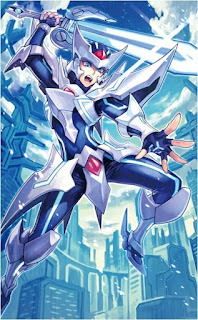 One noted change between the Japanese and international key art is the use of Blaster Blade's Descent of the King of Knights special parallel print for the English edition; in the Japanese edition, Aichi held an unidentified Vanguard card. Past English-language sets have made a point of editing out stride card backs for standard ones, but in this case the card Aichi was holding was completely innocuous by the standards of the international game. August 4th, 2015. During today's weekly stream, host personality Doctor O unveiled the title and launch date for the previously-announced clan booster, G-Clan Booster 02: Commander of Waves. (連波の指揮官 Renpa no Shikikan lit. "Commander of Connected/Successive Waves;" initially misread as 連破 Renpa "Successive Wins") Featuring Euro League pro cardfighter Jaime Alcaraz from the TV anime Cardfight!! Vanguard G, the booster set will launch the month after G-Comic Booster 01: Leaders & Deletors hits the Japanese game. Commander of Waves will launch on October 23rd in Japan. No international release date has been given as of yet. A complete recording of the broadcast may now be viewed below. In other Leaders & Deletors related news, a pair of sleeves were also announced during the broadcast for a September 18th release date. Featuring protagonist Sendou Aichi and antagonist Ibuki Kouji as illustrated by the manga's lead artist Itou Akira, these are the second set of sleeves to feature the manga incarnation of Aichi, after another dual release of manga sleeves from October 2013 featuring Aichi and Kai Toshiki, also illustrated by Itou. 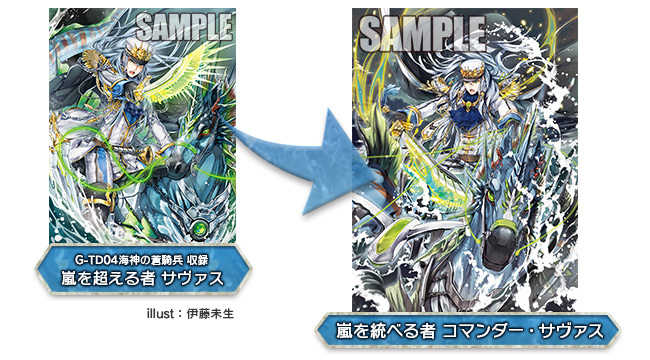 Doctor O also unveiled three cards from the upcoming G-BT04: Soul Strike Against the Supreme, presented below. AUTO (Rearguard circle): Generation break 1: [Counterblast 1] When this unit attacks a vanguard, if this unit is boosted, you may pay the cost. If you do, soulcharge 3, and if a card has been sent from the soul to the drop zone during this turn, draw 1 card. AUTO (Rearguard circle): Generation break 1: [Counterblast 1] When this unit attacks a vanguard, if this unit is boosted, you may pay the cost. If you do, choose 1 of your opponent's rearguards, rest it, and until the end of your opponent's next turn, that unit gets "AUTO (Rearguard circle): During the end phase of your turn, if this unit is rested, your opponent draws 1 card. ", during this turn, that unit cannot intercept. During your opponent's next stand phase, that unit cannot stand. 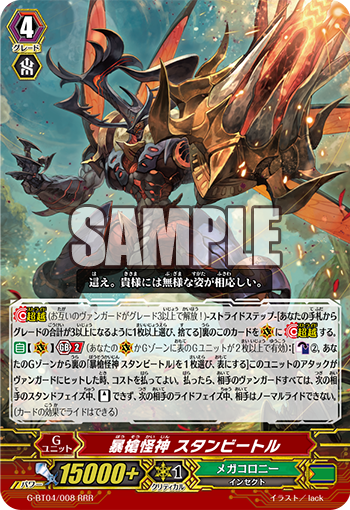 AUTO (Vanguard circle): Generation break 2: [Soulblast 2] When one of your opponent's units is placed on a rearguard circle, you may pay the cost. If you do, rest that unit. AUTO (Vanguard circle): [Counterblast 1] During your turn, when your G unit strides, you may pay the cost. If you do, choose 2 of your opponent's rearguards, rest them, and until the end of your opponent's next turn, they get "AUTO (Rearguard circle): During the end phase of your turn, if this unit is rested, your opponent draws 1 card. ", and during your opponent's next stand phase, those units cannot stand. Above is a complete recording of the stream. 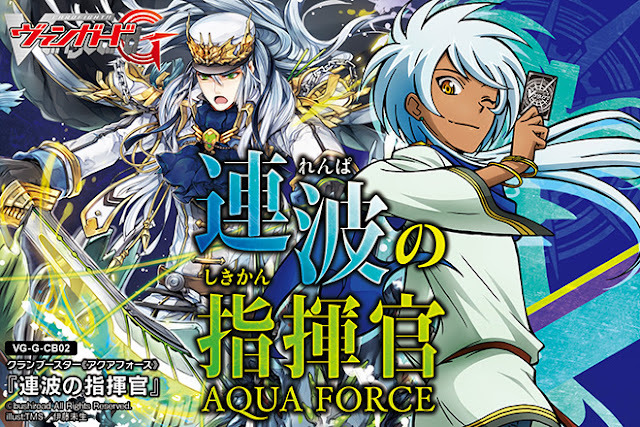 Bushiroad Cardfight event report is at 5:30, Aqua Force clan booster announced at 33:23, manga sleeves at 34:49, G-BT04: Soul Strike Against the Supreme cards shown at 35:54. Today's article was made possible by the donations of our patrons at Patreon. Cardfight Pro is funded by public contributions from readers like you. "Crawl. Such an unsightly form is perfect for you." The Japanese card of the day is a triple rare stride for the Megacolony clan from VG-G-BT04: Soul Strike Against the Supreme. Featured in the most recent episode of Cardfight!! Vanguard G, Stun Beetle is a finishing move with a deceptively designed skill that will almost always ensure victory if resolved; however, there is one specific barrier that prevents Stun Beetle from fully eclipsing its existing Machining counterpart. 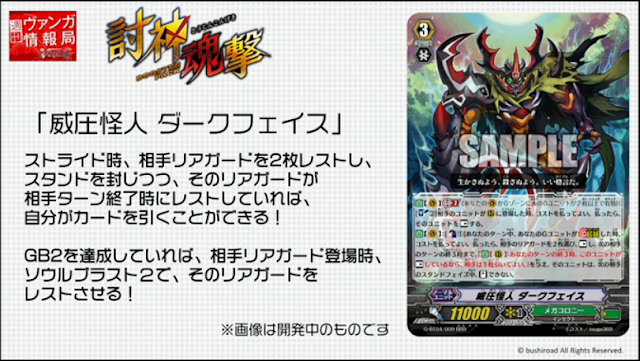 Stun Beetle is among the first strides to use generation break wording rather than specifying a number of cards in the G zone to be face-up. This has not changed the actual mechanics of his skill compared to those strides, it's only simplified the wording; the generation break requirement still counts Stun Beetle himself as part of it. Stun Beetle's skill is impressive on paper, as it both denies the opponent their twin drive for the turn, and prevents them from using the one out that the game has had versus Megacolony since the clan began paralyzing vanguards in VG-BT15: Infinite Rebirth. Because strides inherit the position of the heart, and also pass that position onto the heart in the end phase, Stun Beetle truly leaves no way out of being hit by his skill. This -2 and dramatic loss in offense can be game ending, as outside of activated abilities like that of Takemikazuchi , there are very few ways to recover from Stun Beetle going off to actually catch up in the difference in card advantage it creates. Effectively the card creates a delayed victory condition, where the game is already won on the turn that Stun Beetle resolves, but additional turns have to pass before the opponent is truly unable to keep up any longer. What should be kept in mind is that the stage at which Stun Beetle comes into play is the same as Root Flare and Saint Blow Dragon . At this stage in the fight, the opponent should already have one or more perfect defense cards available, which makes it exceedingly difficult for Stun Beetle to actually connect within his given timing. The card falls into the same trap as Chronoscommand , having a game-ending skill that is unlikely to ever go off because it is attached to vanguard-hit conditions. Moreover, Stun Beetle is appearing on the field at a point when any stride hitting should win the game. The card primarily caters to drawn-out games in which both fighters are staying at low damage over prolonged periods due to a mutual lack of rearguard aggression. This actually plays against Stun Beetle's strengths, as in a prolonged game the opponent is more likely to be able to take a hit from Stun Beetle and still come out victorious, as they're potentially taking that hit while starting at one to two damage. Because of his persona generation condition, running Stun Beetle at a playset can be detrimental to stride efficiency. If during one of these protracted games, the first Stun Beetle is blocked but the second one goes off, there will be three face-up Stun Beetles and the fourth becomes a dud stride. The same is true for if three Stun Beetles are blocked. 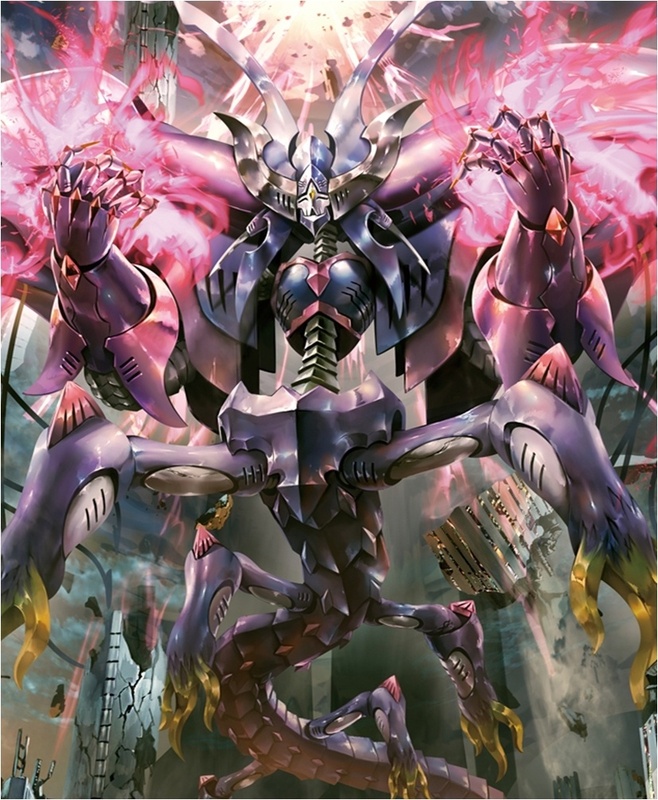 Compared to Machining Destroyer from Fighter's Collection 2015, Stun Beetle is a lackluster means of paralyzing the opponent's vanguard that's unlikely to ever go off, gives the opponent better aggressive options, and they need to survive through one less turn than when staring down a playset of Destroyers before the vanguard-paralyze options become locked off. The optimal means of using Stun Beetle is at 2~3 copies, but in the presently dominant Machining decks, Beetle cannot compete with Destroyer and that puts him in conflict with Paraspear's draw ability. It's difficult to argue for sacrificing Paraspear's draw in a deck that's starved for defensive options. Hence, while Stun Beetle provides a powerful killing blow, the difficulty associated with pulling it off and the sacrifices necessary to take multiple shots at it mean that unless the vanguard and rearguard support of G-BT04 is more compelling, the Machining subclan is likely to remain the dominant form of Megacolony for the foreseeable future. As this subclan is on the verge of receiving new support cards from Soul Strike in the form of the Machining Scorpio mkII and Mosquito mkII legion pair, and the enigmatic Machining Yellow Jacket, tomorrow is bright for the subclan and dim for genericized Megacolony. 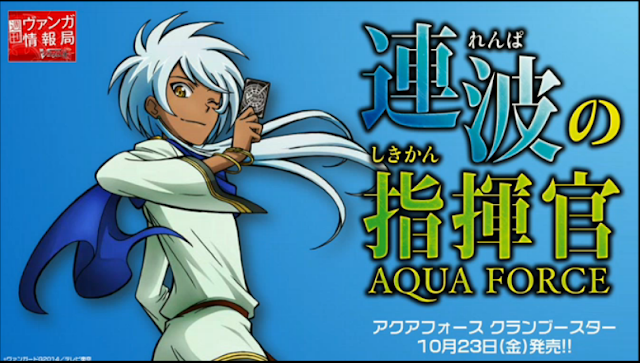 According to Bushiroad Inc.'s Cardfight!! Online Twitter account, the web game just hit Steam Greenlight's top 10 list today, putting the game in the top 10 out of 1,400 games currently on Greenlight. This took place within 49 hours after the game first went up, demonstrating enormous popular support for the game. Readers are encouraged to support the Greenlight effort by upvoting it through their Steam accounts. Readers who do not have an account are encouraged to register one; registration for Steam is free, and as Cardfight!! Online will be free-to-play, fans have every incentive to support the effort.